Particularly: Add Battle enemies! locations. A nectar egg (known before Pikmin 3 as simply egg) is a white, semi-round object found in alcoves of caves, and on specific places aboveground. It is unknown if they come from any kind of creature or plant and it may be possible that they are merely egg-shaped containers. They can be attacked, and when broken, they release nectar, although they can also release other things. 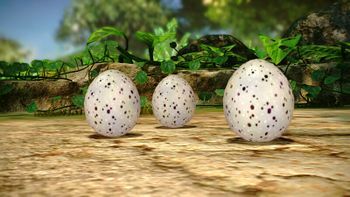 The eggs held by Honeywisps in Pikmin 2 function identically to grounded eggs. To destroy an egg, it must be attacked with Pikmin, punched at a few times with a leader, or destroyed by an enemy projectile, like a Gatling Groink's fireworks. For Pikmin 2, it is advisable to throw a Purple Pikmin onto an egg, as this will immediately break it and contained Mitites will be instantly defeated. It is also recommended to destroy an egg with a leader, as a Pikmin thrown at the egg may drink the nectar after being called back, wasting it. Particularly: Discover what the chances are for when the player doesn't have a certain spray. In Pikmin 3, certain eggs are programmed to always drop certain objects. For example, some of the eggs in the hollowed-out tree in the Tropical Wilds where the Juicy Gaggle is found are pre-programmed to always drop bomb rocks – the only known ones to do so. Other than that, some eggs in Mission Mode always drop ultra-spicy spray. Most eggs in Story mode can drop either nectar or ultra-spicy spray. If ultra-spicy spray has not been discovered, they will only drop nectar, as ultra-bitter spray and Mitites are not present in this game. Suggestions: Complete the Pikmin 3 list, and add cave, challenge mode and battle mode locations. There are no nectar eggs in the first game, but they can be found in many places in Pikmin 2 and Pikmin 3. Their location in areas is always constant, and they always respawn whenever the area is entered. Underground, there are several sublevels with eggs, some having more than one. Eggs that fall off the ceiling of caves will instantly break when they reach the ground. A group of three, near the landing site. A group of two, between the Beady Long Legs and the original location of the Yellow Onion. A group of three, near the entrance to the Glutton's Kitchen. A group of three, on the intersection between the two main parts closest to the landing site. A group of four, near the Anti-hiccup Fungus. A group of three, near the entrance to the Hole of Heroes. A group of seven in the tree stump where the Medusal Slurker holding the Juicy Gaggle is found. A group of three in the secondary circular arena the Shaggy Long Legs is fought on. A group of three at the end of the meandering path with the Pyroclasmic Slooches. A group of eight in the Shaggy Long Legs arena, with one of them hidden under a Flukeweed. A lone egg is hidden under a Flukeweed near the discovery location of the Winged Onion. Most eggs are found on top of the walls inside the oak. A single egg in a cave, in Pikmin 2. A group of eggs in the Wistful Wild. An egg just after being broken, in the Perplexing Pool. Nectar in an egg in Pikmin 3. A dose of ultra-spicy spray in an egg in Pikmin 3. Nectar eggs in an unused cave in Pikmin 2 (pom_floor). A nectar egg about to break in Pikmin 3. This page was last edited on February 17, 2019, at 18:12.